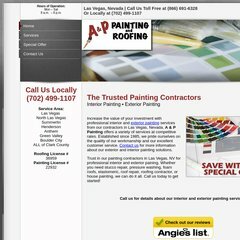 Topics: Services, Special Offer, and Exterior Painting. It is hosted by Website Pros (Florida, Jacksonville,) using Apache web server. A-ppainting.com's server IP number is 64.69.220.144. Its 3 nameservers are dns1.registeredsite.com, dns2.registeredsite.com, and dns3.registeredsite.com.